For the past few months I've been putting a prototype cooking system, designed specifically for use with popular UL mugs, through its paces for Flat Cat Gear. The system I've been testing is called the Snow Leopard and is a scaled-down version of their popular Bobcat setup that is used with larger pots. 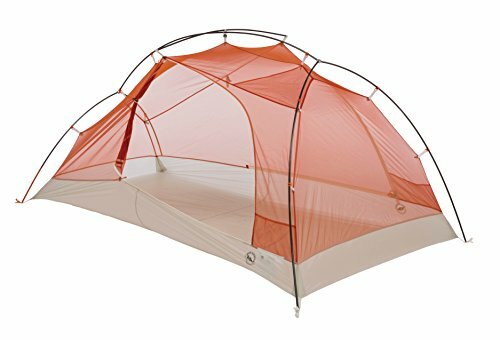 I recently received a production version of the Snow Leopard cook kit and after several rounds of testing and a couple uses on day hikes I have to say that I'm very impressed with the quality, design, and most importantly the results. The Snow Leopard cooking system is targeted at solo hikers who like to use mugs as their main cooking vessel. It comes in three size options; original, senior, and junior. Each size option is specifically targeted at different sizes of the most popular brands of UL mugs on the market. I've been testing the Original Snow Leopard which is made to fit perfectly inside of the Snow Peak 700 titanium mug. The senior model works with the MSR Titan Kettle and several of the Evernew pots, whereas the junior model fits the Snow Peak 600 (my personal pot of preference). 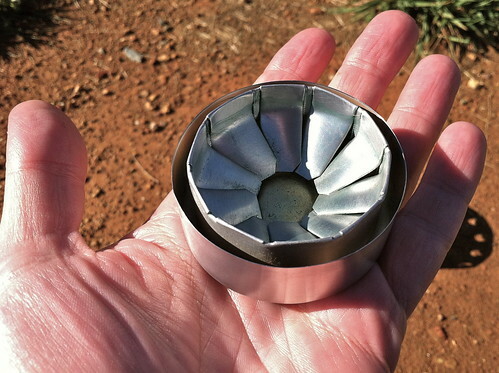 If you are already familiar with the standard Flat Cat alcohol stove that comes as part of the Bobcat system, the Snow Leopard is just a smaller version that has an additional outer ring/cup that is permanently attached. That extra outer cup is not a primer pan, but it is a critical part of the stove and plays a part in the performance of this smaller version. 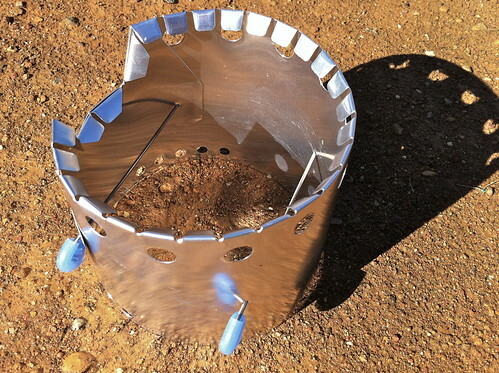 The stove is designed to be low profile but highly efficient. 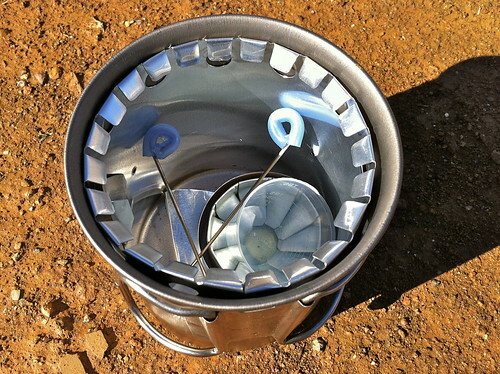 Despite it's space-age flying saucer like appearance, it is essentially an open reservoir stove. 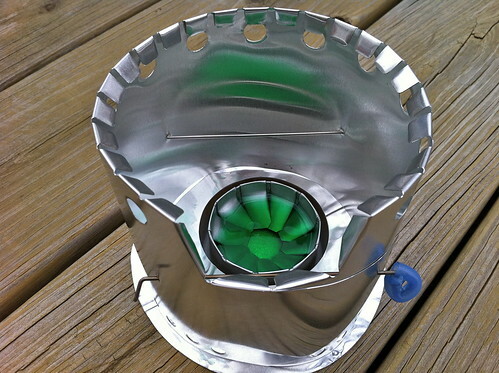 Unlike the side-jetted Bud Light alcohol stoves that I am used to, the Flat Cat stove does not need to be primed as it doesn't need to build up heat or any pressure in order to plume. Just light it and you're good to go. However, because the stove is extremely low profile and has a flame that is barely an inch from the ground, it is essential that the heat shield always be used to avoid scorching the ground or even setting it on fire. The photo above shows the Snow Leopard Flat Cat stove filled with 1 fl oz of user-friendly denatured alcohol, but the stove is designed to take up to 1.5 fl oz of fuel. After running dozens of tests on the stove, I've found that the fill line for 1 fl oz of fuel coincides nicely with the bend/elbow of the folded tabs. I don't know if that was by design or a happy accident, but it works for me and means I really don't have to bother carrying the plastic measuring cup any more. To me the windscreen that comes with the Snow Leopard cook set is the heart of the entire system. As I mentioned earlier, it's designed to roll up and fit perfectly inside your mug for convenience and to stop it getting damaged. It's more than just a wrap around piece of foil used as a windscreen Like the Caldera stove design, the Snow Leopard windscreen serves as both a windscreen and cup holder. The windscreen is help in position by the two pot holding pins that come supplied with the kit. 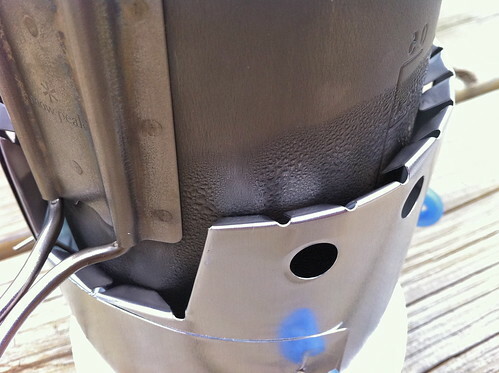 They slide through the pre-drilled holes and hold the windscreen in place doubling up as the two inner supports that hold the mug up off of the stove. I particularly like that there are small sections of silicone tubing on the ends of each pin so you don't burn your fingers. You'll notice a section of the windscreen is cut lower than the rest, that is to accommodate the handles of the mug as it sits into the windscreen. 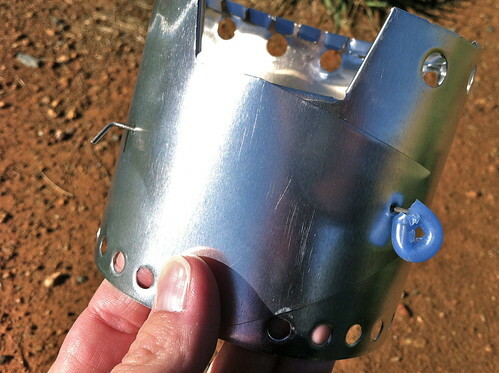 Using the Snow Leopard stove is simplicity itself and shouldn't be a surprise to any experienced alcohol stove users. Unfold and heat shield and place it on a flat surface. This protects the ground and reflects heat back up underneath the stove and mug. 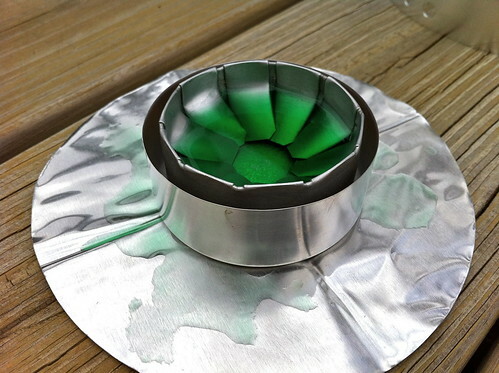 Place the Flat Cat stove in the center and fill it with alcohol fuel. I used 1oz of alcohol but found that my flame out was typically a few minutes after my rolling boil times, so I could have easily cut back to 0.5oz of so. More on boil times and results below. Put together the windscreen using the two pins that are provided making sure that the are securely in place with the bent ends all the way through the second holes. I like to light the stove using my Bic Mini lighter before putting the windscreen over the stove, but under very windy conditions I would recommend placing the windscreen over the stove and then lighting it. Once the stove is lit you can lace your mug with the desired amount of water on top of the stove and inside the windscreen making sure that the handles are where the large cut out section is. I was amazed at how quiet this cooking system is. In fact it's silent at the beginning and until the water starts to heat up. 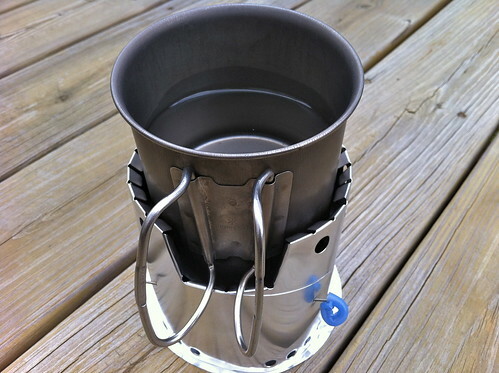 I'm used to the sound of a jetted alcohol stove I guess, the open reservoir design means that there is no pressure and definitely no noise. I had to lift the mug and check the first few times I used the stove. A clear visual indicator that the stove is working is when you begin to see condensation building up on the outside of the mug, assuming you have cold water inside of course. You could just bend down and peek through the bottom holes of the windscreen, but that was easier said than done. The efficiency of this stove comes largely from how well the windscreen fits around the body of the mug. 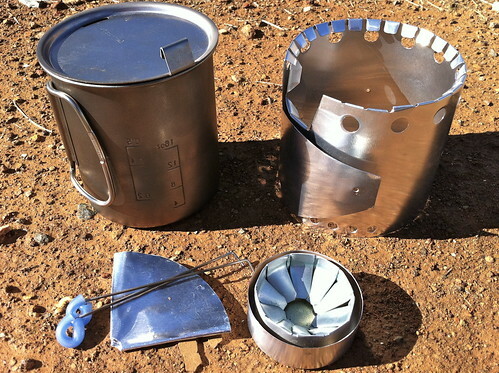 As you can see in the photo above and several of the other images, there are dozens of small folded tabs that close the gap between the diameter of the windscreen and the edge of the mug, while at the same time providing just the right amount of airflow to feed the stove below. There are a series of large air holes at the top of the windscreen and smaller ones at the bottom. Here is a mug/pot sizing compatibility chart. If you don't see your mug or pot listed, use the measurements on row two to determine if one of the size options will work with your pot or mug. As you probably all already know, I have used a lot of different stoves over the years with varying results (Esbit is only just now back on my good list). So believe me when I say that the Flat Cat is one of the best I have used, for a couple of reasons: It's sturdy (not overly delicate), easy to set up, easy to light, and easy to use (more or less unattended - gasp!). 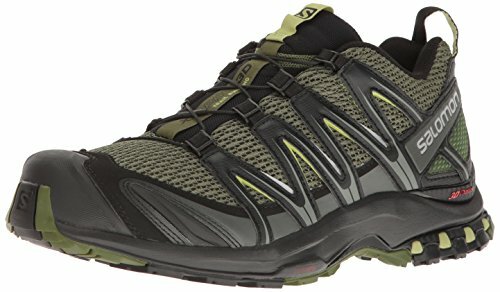 I've been using it on and off the trail for the past four months to point where Jon is bugging me to give him his gear back (which by the way is not going to happen, at least without a fight). It carries safely and securely inside of the Snow Peak 700 mug and allows me to carry far less fuel that I needed to with my Bud Light stoves. I actually now have a prototype Snow Leopard Jr. made just for my beloved Snow Peak 600 mug. 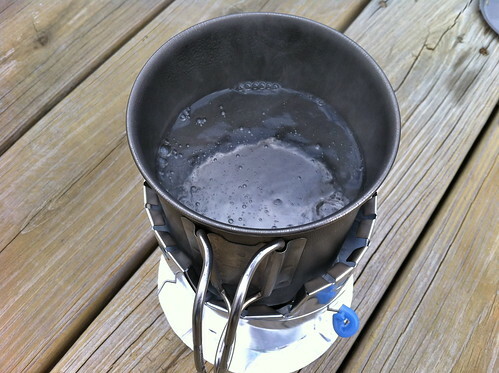 For all of my tests I used only 1oz of denatured alcohol per burn and with the exception of one particularly windy and cold day, found that the two cups of cold water came to a boil long before the stove flamed out, typically with another 2-3 minutes to spare. My boil times fluctuated between 6 - 9 mins to bring two cups (16fl oz) of cold (~40 F) water to a full rolling boil. The best time that I had was a 6:38 boil with a flame out at 9:21, but the outdoor weather conditions were very favorable with barely any wind. I should add that I always boil my water with the lid on my cup to keep in as much heat as possible. The photo above was just to show the boiling water inside the SP 700 mug. Unlike many other stoves I've used or tested, I did not experience a single instance of the stove being snuffed out accidentally by wind or any other factor. That is a first for me with a class of stove that is known for being finicky. Given how much I love stoves; whether it's making them, testing them, or just having fun using them as intended, I'm reluctant to say that I may have stumbled upon the perfect stove for me. It's compact, lightweight, efficient, easy to use, and works with my existing mug. I can carry a much smaller amount of fuel than I used to need to carry and I can even use it with an Esbit fuel tab and my new Ti Tray Stove. I'm a little unnerved at the realization that I could, if I were inclined, stop searching for the holy grail of UL stoves as this is most likely it. There really is very little, if anything, that I would change about this entire setup if I had the opportunity. Well, maybe a complete Snow Leopard set made out of titanium - hehehe! So here's an opportunity to provide your direct feedback to Jon at Flat Cat Gear. The Snow Leopard Jr. (fits the SP600 Ti mug) is not currently in full production, Jon is custom making those to order. 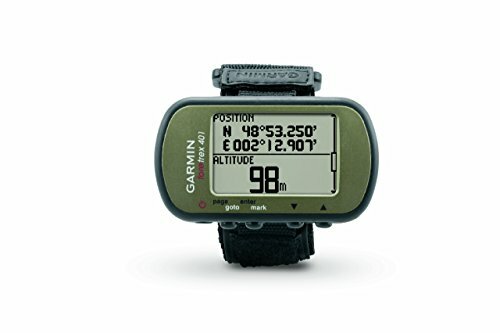 Do you think that there will be enough demand for a Snow Peak 600 compatible version (remember the SP600 does not come with a lid) or should he focus on the original and senior size models which are being production manufactured? 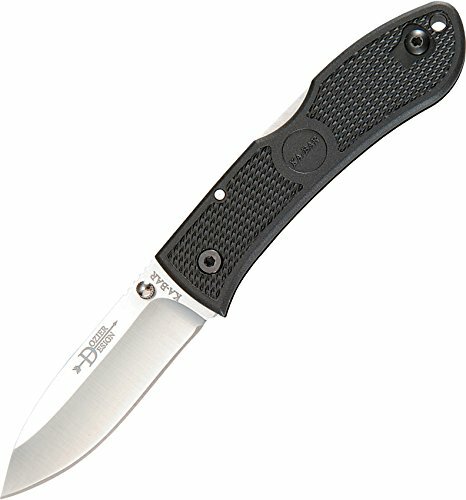 As a die-hard SP600 user I'd be interested to hear what you have to say. 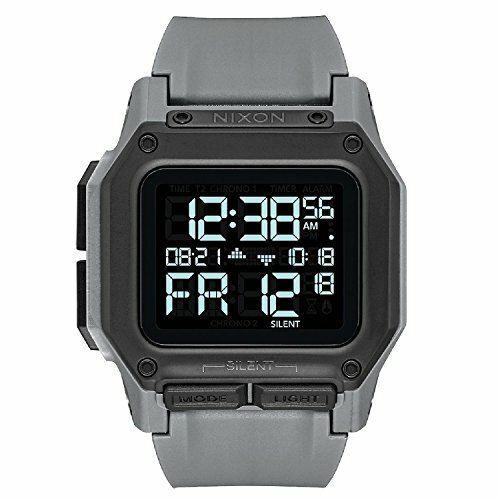 Also, do you think titanium versions would be desirable?